The long-term cancer risk of mobile phone use cannot be ruled out, experts have concluded. A major six-year research programme found a "hint" of a higher cancer risk. The MTHRP programme, funded by the government and communications industry, has carried out 23 separate studies into the health impact of mobile phones, masts and base stations. Programme chairman Professor Lawrie Challis said it was now up to the government to offer advice. The team found that there was a slight excess reporting of brain and acoustic neuroma (ear) cancers. Researchers said this was on the borderline of statistical significance. Professor Challis said that it was only responsible to do more research, citing the way smoking was not linked to lung cancer at first. He said: "We can't rule out the possibility at this stage that cancer could appear in a few years' time. He said the problem during the study was that there had been very few people using mobile phones for over 10 years. Cancers do not normally appear until 10 to 15 years after exposure. But he said overall the evidence that mobiles did not pose a significant health risk was "pretty reassuring". The team looked at factors affecting blood pressure, heart rate, and electrical hypersensitivity, which include symptoms such as headaches, dizziness and tingling. They concluded there was no risk. It was established following publication of an independent government-commissioned report into the safety of mobile phones in 2000. The report, produced by a group led by Sir William Stewart, concluded that mobile phones did not appear to harm health - but recommended further research was carried out. 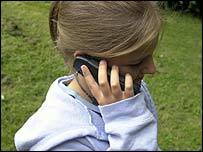 However, in 2005 Sir William warned that mobile phone use by children should be limited as a precaution - and that under-eights should not use them at all. Both emit radio signals and electromagnetic fields that can penetrate the human brain, and campaigners fear that this could seriously damage human health. Lib Dem science spokesman, Dr Evan Harris, said the findings were "good news for the public", but it was only right more research was carried out. "The current precautionary approach - involving limited restrictions on mast-siting relating to schools for example and advice about limiting use by young children - is reasonable and this research demonstrates that there is as yet no justification for a more restrictive approach." But a spokeswoman for the Mast Sanity campaign group said: "We believe mobiles are harmful to health; plenty of other studies have shown this. "The programme has not really got to the bottom of this; it is too close to industry."